2019 social media research demonstrates that social media usage in the United States has changed A LOT in just a short time. Released hours ago, a new report from my friends at Edison Research and Triton Digital uncovered many statistically significant social media usage patterns that showcase the next wave of shifts in how and why Americans use social media in 2019 (or don’t). The Infinite Dial 2019report continues the annual research series that consistently produces important findings that describe how we use social media, podcasts, and online audio services. 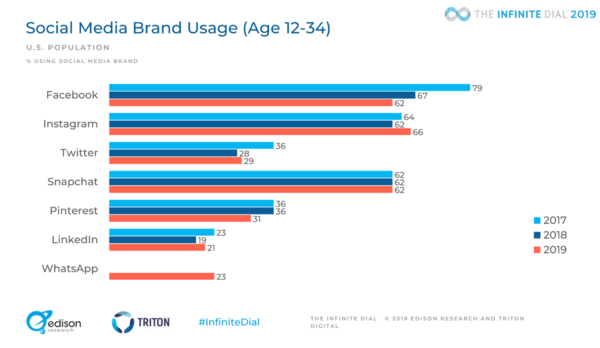 I highly recommend you grab the entire report, as the highlights I cover below are a VERY small selection of the social media research and consumer behavior statistics included in The Infinite Dial 2019. 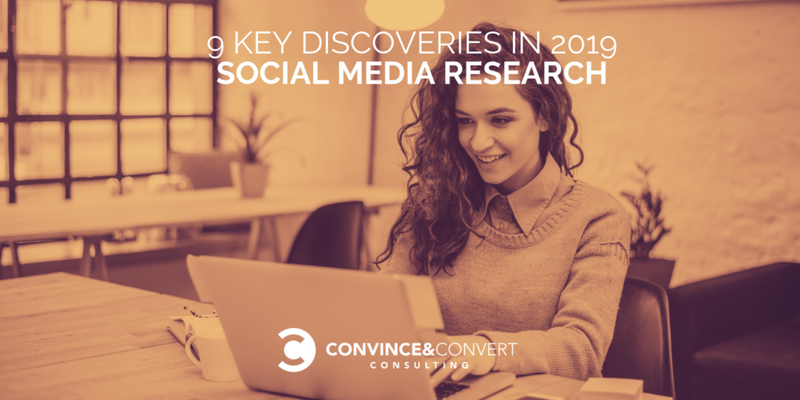 Here are the nine vital 2019 social media research trends that this report surfaced, based on a survey of 1,500 Americans, ages 12 and up. 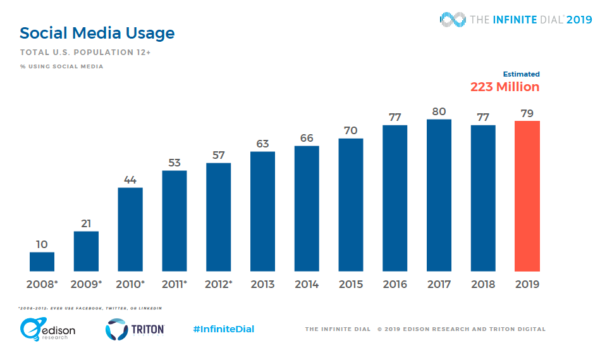 Compared to the social media statistics from the 2018 version of The Infinite Dial, social media usage overall is up from 77% of the 12+ population to 79% of the 12+ population in 2019. In terms of actual numbers of social media users, social media usage in America grew from 216 million to 223 million people between 2018 and 2019. While the most recent social media research shows a slight uptick in overall usage, the number of Americans using social media has stayed essentially unchanged since 2016. In short, the last year of real growth for social media in the United States was 2015. At this point, barring substantive demographic or technology shifts, the social media population is fixed and mostly static. 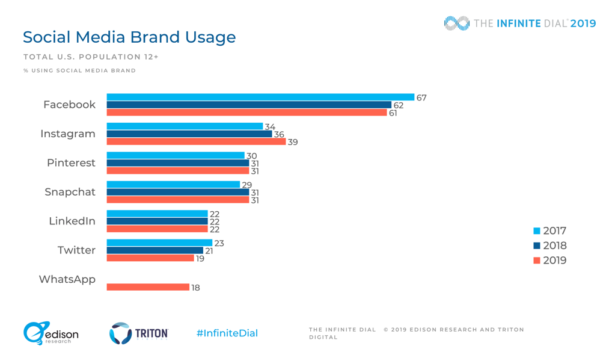 Instagram is the only social network where usage in 2019 is greater than usage in 2018. Every other social network was flat or declined in the past year. 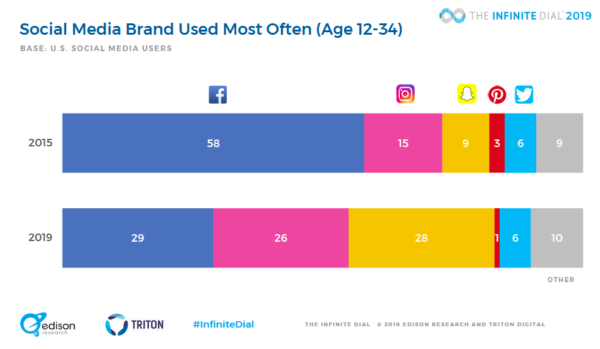 Also, for the first time, Instagram is now the most popular social network among Americans 12–34, ahead of Facebook and Snapchat. This is the first time since Facebook opened to all that it was not the most popular social network among all age categories. I have predicted that Instagram will become more popular than Facebook. It may not happen for all Americans by 2020 as I suggested, but it’s already happened among young Americans. Despite their own reports of a slight uptick in active users, the percentage of Americans using Twitter at all fell again in 2019. Fewer than 2 in 10 people 12+ use Twitter, putting the platform sixth in terms of usage. Even 6th place is perhaps a bit of an overstatement, as more people use Facebook Messenger than Twitter (Messenger was not broken out in this study), and the trend line suggests that Twitter will fall behind WhatsApp by next year. This edition of The Infinite Dial social media research again found that 22% of Americans use Linkedin — for the third year in a row. Despite Linkedin’s many attempts to add virality and functionality (now with live video!) the percentage of Americans 12+ using the platform has barely budged since 2014, when it was 19%. Compared to 2018, usage of Pinterest also remains static, with 31% of Americans ever using the service. Growth is eluding Pinterest, which makes their decision to file for an initial public offering somewhat curious. Especially considering that among Americans ages 12–34, Pinterest usage declined from 36% to 31% last year. Facebook is becoming steadily less popular among young people, as 17 million fewer Americans ages 12–34 use the platform at all, compared to 2017. Conversely, when it comes to Americans 55 years old or greater, Facebook is now — for the first time — used by a majority of this group. 53% of Americans 55+ use Facebook, compared to 49% in 2018. Despite rumors of a sharp decline due to interface changes and Instagram copying key features, usage of Snapchat is essentially unchanged. In this 2019 social media research, 31% of Americans use Snapchat, at least occasionally. This is the same audience size as last year. 62% of United States residents 12–34 use Snapchat, and 28% of young Americans use it more than any other social network (compared to 29% for Facebook, and 26% for Instagram). These are the nine key discoveries for me in this year’s edition of The Infinite Dial. But there are a lot more lurking under the surface. Grab the entire report and see for yourself.